Boom. That is my pretty new updated rental house kitchen. But let's reverse. 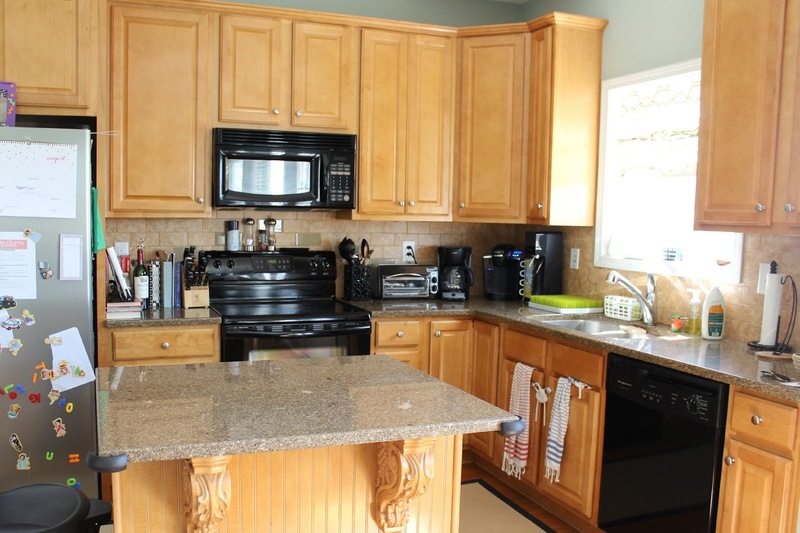 The kitchen in our rental house is pretty much like "heyyyyy 2004, what up with your orange-toned oak cabinets, stereotypical colored granite countertops, polished nickel fixtures and brown-ish tile backsplash with sea-colored glass inserts?" Not complaining, but not my cup of kitchen design tea. Every time I looked over into the kitchen, my eyes started crossing with all of the orange/yellow oak-i-ness. After two years (!!) of living here, I decided enough was enough and it was time to do something. We threw down some black bordered jute runners on the floor to cover up some of the orange oak-y floors (yes, same color as the cabinets. so. much. oak.) but that wasn't enough. My first thought was that we had to do something with the cabinets but I really couldn't come up with a renter friendly solution. Painting the cabinets is off the table. 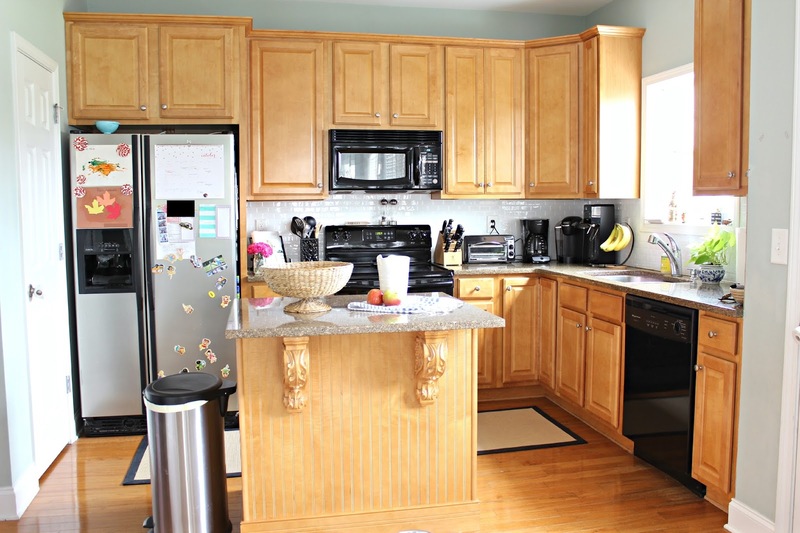 Taking off the cabinet doors and papering the back? So pretty but no one wants to see the stack of rainbow mismatched sippy cups in my cabinets, especially me. Cover the cabinets in pretty contact paper? I almost, almost did this but realized it would be a bear of a project and I just don't have the time, energy or patience for that. 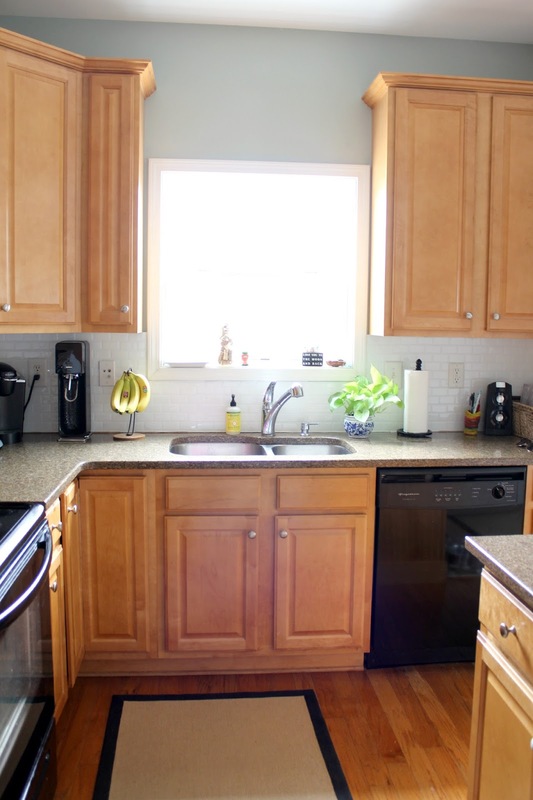 So I rerouted- leave the cabinets as is but what about the brown backsplash tile? I thought, if there was just some way I could break up all of the brown/orange with a bright white, maybe that would make a difference. What if someone made some sort of temporary tile covering that did that job? Enter Smart Tiles. Smart Tiles is sort of the most genius idea ever for renters who hate their kitchens or baths. Or even if you're a homeowner and you want to temporarily redo your kitchen or bath tile without the mess and expense of actually installing new tile. Guys, this tile is a STICKER. A sticker. Or, more appropriately, a self-adhesive wall tile. Like, peel and stick. No joke. All you need to "install" this product is a tape measure, a precision cutting knife or box cutter, a pencil and a cutting mat (I used a cardboard box flap!). No glue, no paste, just peel off the backing and stick on up there. For me, the only difficult part with this entire process was measuring. You have to measure exactly right to order tiles (but they have a handy estimating system calculator on every order page!) and exactly right to cut the tiles to fit around wall outlets and odd shaped areas of your kitchen or bath. I used the interlocking subway tiles so I had to do a lot of cutting and measuring to make sure everything matched up correctly. Luckily, Smart Tiles has an awesome installation video that I watched multiple times for reference. Still, if your hardest obstacle is measuring correctly, that's quite an easy DIY project if I do say so myself. I will say that there were a couple of areas that turned out a little "off" with the tile. For example, our tile that we were covering up sort of wraps around the edge of our walls and the Smart Tiles couldn't bend and stick on that edge. Also, the corners didn't always match up perfectly and I could see a little gap of the old brown tile, but I think a lot of that is that our walls or the original tile is uneven! So, truly, no glitches with the product but more so with the space I was covering (and probably some user error by me!). 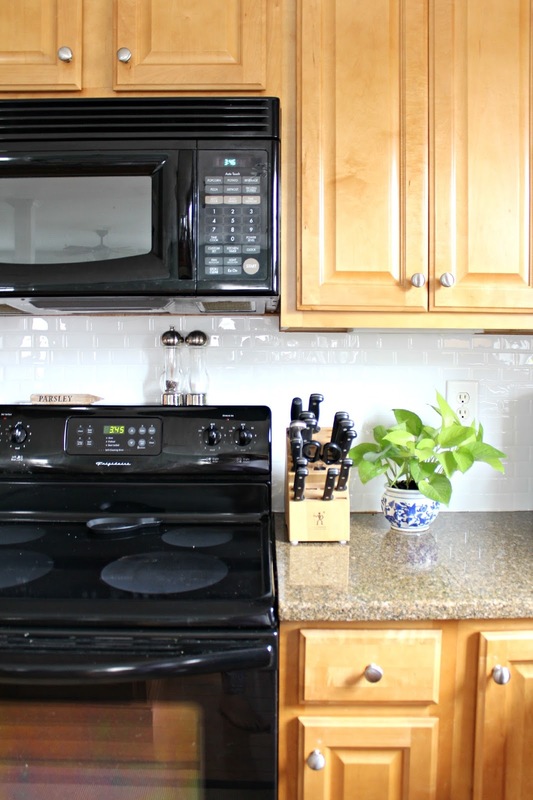 Overall, I absolutely love the look, love the product and cannot believe it took me two years to freshen up this space by simply spending a few hours sticking on some new tile! Also- I asked this question a couple of times so I can be sure I'm not losing out on my security deposit, but the Smart Tiles are fully removable! When you're finished with them, just peel 'er off. Check out their FAQ section for more installation questions and answers. For those of you who are interested, you can buy Smart Tiles here at Home Depot, here at Wayfair and here at Amazon. Or straight from the Smart Tiles website. So much lighter and brighter thanks to a STICKER! Amazing. Now I'm scheming where else in my house I can update simply by covering in Smart Tiles. Do you think my landlord would notice if I started laying them over those terrible orangey floors?! Please know that I was not compensated for this post but did receive product from Smart Tiles. I researched the company and scouted out their great product before partnering with them for the blog so I truly support the product. And, of course, all opinions and reviews are mine. Looks fantastic Michelle! Love products like that. Classy update! Can you notice any seams where the overall tiles meet? Or do the "joints" match well enough to look like real tiles? 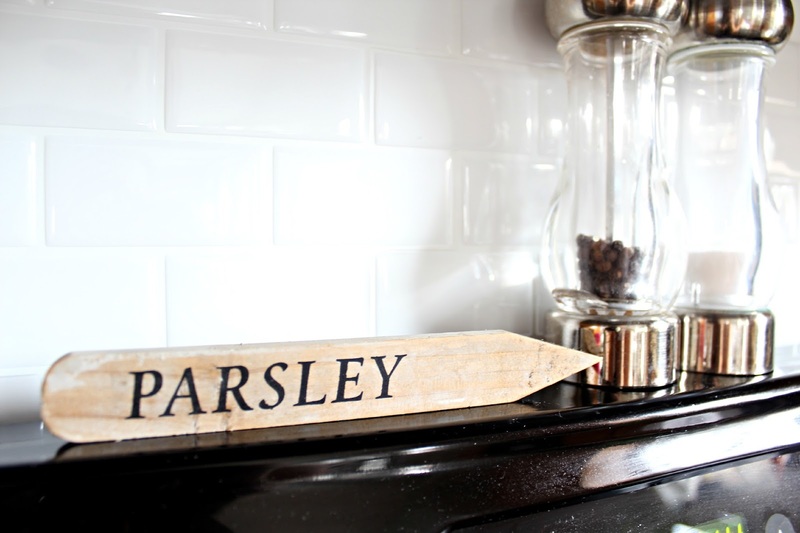 I want to do the same subway tiles from Smart Tiles, but I'm worried that my brightly lit kitchen walls will emphasize the tile seams and look fake.